A year ago while on holiday in our campervan on a storm bound Hebridean island we thought about how little space we needed and decided to spend the winter preparing to move out of our house so that we could let it during the summer months. With all the children having flown the nest, it is a large space for two of us and we are rarely indoors during the summer. 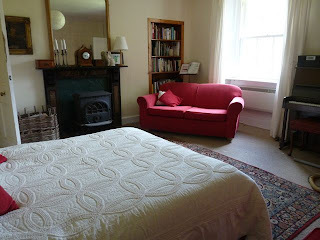 We arrived home to the discovery that we had a double booking and so some very understanding visitors were the first to sample staying in Seafield Farmhouse after our rather hasty preparations. A year on and the house is almost prepared for public consumption. 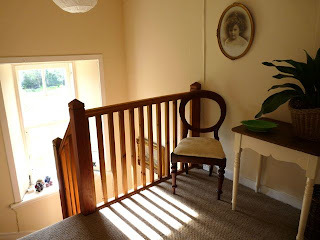 We were nearly ready when our visitors in Byre Cottage needed to extend their stay for a fortnight and it is amazing what you can achieve with two day's notice. Needless to say, the winter had been spent on the sofa, close to the woodburner rather than performing admirable feats of de-cluttering. 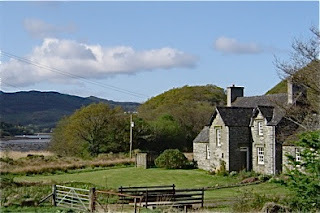 Letting Seafield Farmhouse is not a new concept. Granny and Grandpa Livingston sent the children to relatives in the summer so that the house could be let to families who came up for six weeks at a time. We have a copy of a delightful diary kept by the daughter of one such family who stayed here in 1928 for whom Granny cooked 'monstrously good suppers'. In the 21st century, the accommodation will be strictly self catering! We are not sure of the exact age of the house. It has been described as 150 years old for at least the last 40 years. It was built as part of the Poltalloch Estate and sold to the Forestry Commission in the 1930's. Grandpa Neil Livingston arrived from the Isle of Luing at the beginning of the last century when Seafield was a sheep farm. The Forestry Commission planted the hill with sitka spruce and Seafield became a sixty acre smallholding comprising mainly of rock and bog. His son Jimmy Livingston took over the farm and also worked full time for the Forestry, operating a winch. In time, his son, my husband, James Livingston came home to look after the place and was also employed by the Forestry Commission. As a tenant, James was able to buy Seafield in the late 1980's and could then diversify into holiday lets, sawmilling and firewood processing. He has recently taken early retirement and so we hope to be able to continue to improve the facilties we provide so that many more people can share the stunning place we are fortunate to be able to live in. That's when James isn't fishing of course. On the ground floor, the house has a large, 30 ft long conservatory which we added in 1997. This is the main living and dining area and has a woodburning stove. 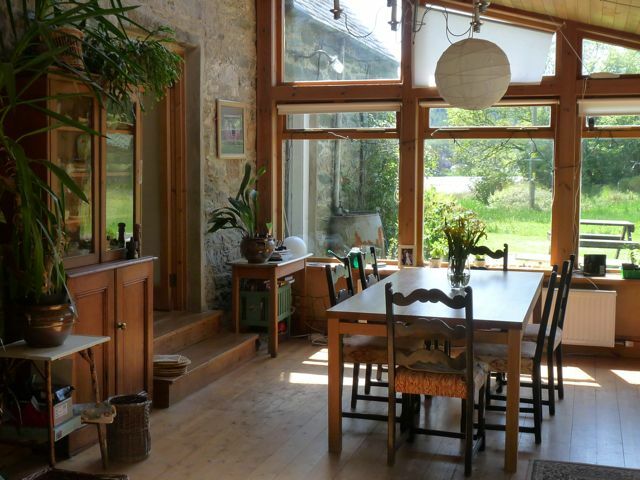 Off the conservatory is a large kitchen with units made by a local craftsman with reclaimed timbers from redundant Crinan Canal lock gates. 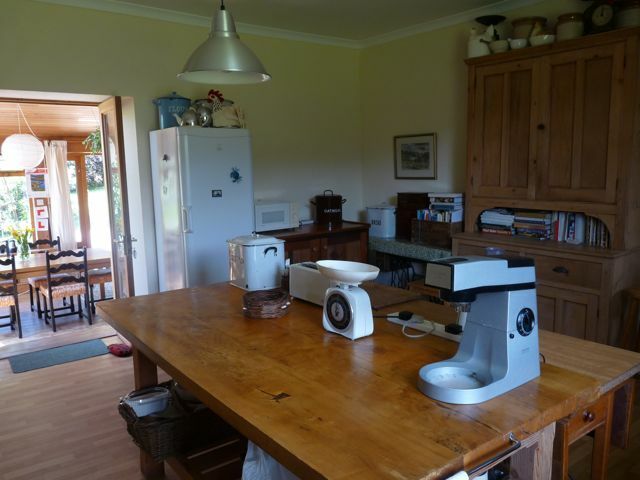 It has a dishwasher and dual fuel cooker with gas hob and electric oven. There is a combination microwave and large fridge plus the usual small appliances. Off the kitchen is a utility room with washer and freezer which is accessible from the kitchen but also has a separate exterior door. 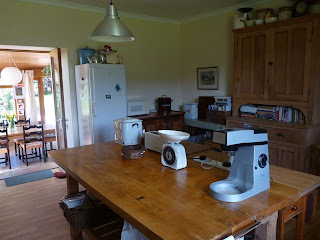 We need access to this space from time to time as it houses our freezer and a large oven which I need to use occasionally - but we will be as unobtrusive as possible. The hallway which has a small cloakroom, leads to a family suite of double bedroom with adjacent twin bedroom and ensuite facilities. 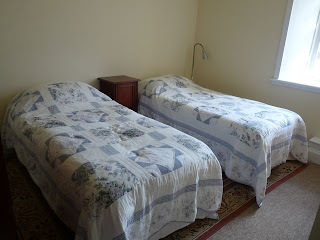 Upstairs, there is a large double bedroom with king sized bed and a bathroom with bath and shower. 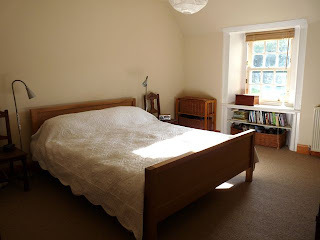 The second bedroom is not available for letting as it is in need of complete refurbishment and will be used for storage of all the things we don't know what to do with. 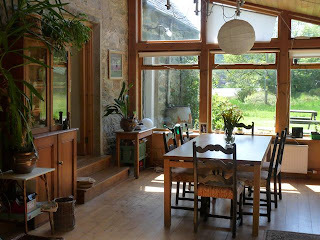 Central Heating and hot water are from the log fired boiler and there is a woodburner in the conservatory. During warmer weather, the boiler is off and heating and hot water are provided by electricity - mostly generated by the photo voltaic panels. 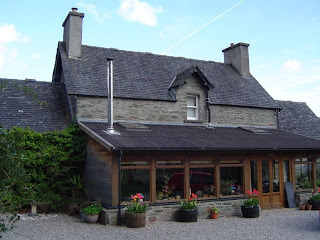 Seafield Farmhouse is available for holidays during June, July and August. We may extend into September if all goes well. Sorry, no pets and no smoking. Children are welcome. With Byre and Stable Cottages just next door, there is plenty of scope for larger family groups who want to spend time together while enjoying their own space.